Last week I announced I was participating in this year’s Sewing With a Plan (SWAP) challenge. I said I would make ten items, and buy one. Here are some ideas of multi coloured cardigans that I am attracted to that could form a basis for my wardrobe. The first is very similar to the one I had last year. 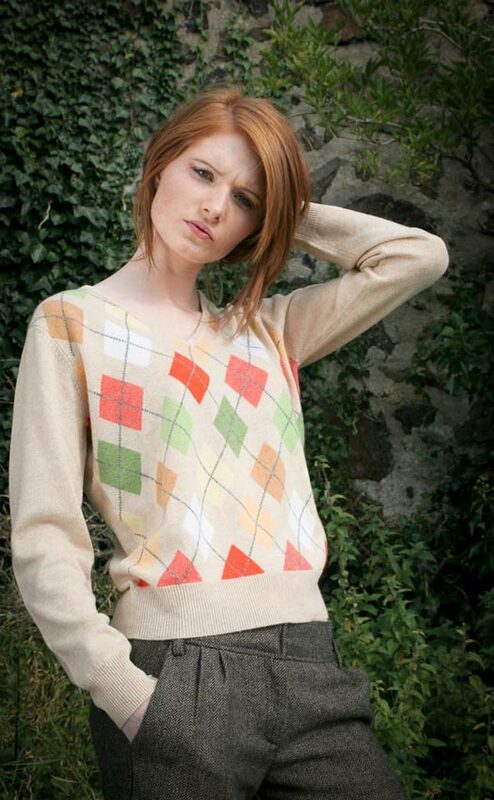 The Brora one is made from wool and mohair, and beautiful if rather expensive. The Boden one is different and I like the colours. I put these pictures up just to give an idea of what I am trying to do. Misan Fabrics, in Berwick Street, is one of my favourite shops. It carries many lovely woolens at £50 a metre or more. However I just cannot justify spending say £150 on fabric for a suit. £15 to £20 is what I consider reasonable. For this price the fabric is usually polyester. So I did not go to Misan. To get 100% virgin wool, beautiful tailoring cloth, unusual designer fabrics, end of line bolts of exquisite cloth for a bargain price is worth a trip to the deepest south (it’s only at the end of the Victoria line; doable in my lunch hour if necessary). 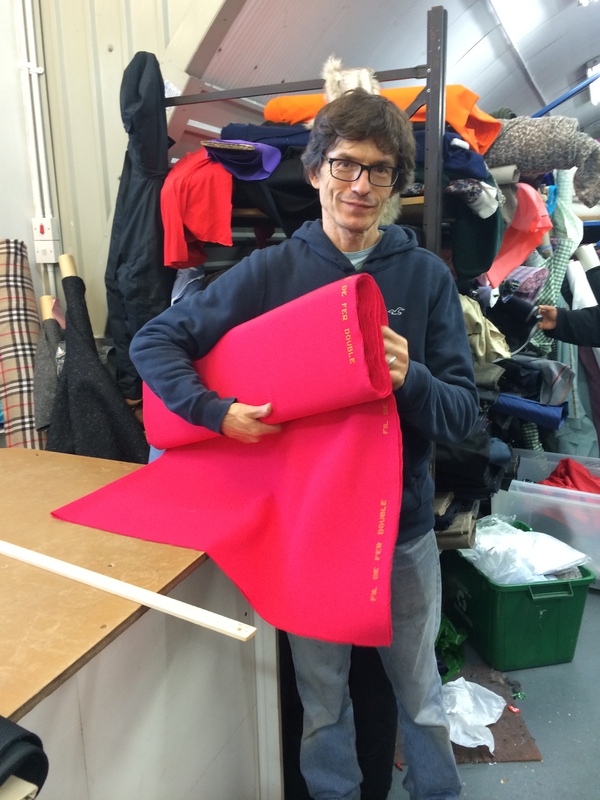 I went to my favourite fabric shop – Simply Fabrics – in Brixton. a young designer, dressed in brown velour, bought a further 10m of the same fabric. The wonder of this shop is that is has some very good quality cloth at low prices. Wools cost between £5 and £10 a metre. One down side is that it is a bit of jumble sale and you never know what you will find. They don’t sell online so you have to go and have a mooch around. But if you appreciate and can identify quality it is a treasure trove. Of course there is one major limitation – you have not got unlimited choice. While I went in with an idea of a yellow and green colour palette as a possible option, and found three or four plain dark greens, there was nothing other than that tartan that had green with other colours. Well there were a few greens and yellows, but not in my shades of (cool) blue-greens and clear yellow yellows. So you have to adapt your plans to what is available. I don’t have much energy or inclination for shopping around. If it is not in my cupboard or Simply Fabrics it is not going to feature in my SWAP. The lace (on a white sheet) is dark navy – can you see the dinosaurs? The others are all lovely fabrics suitable for separates or suits, and I considered them all for the SWAP. Immediately after identifying and getting excited about two of them – the green/turquoise/purple plaid and the green Chanel type fabric – I had to walk away from the display. Although they are gorgeous quality, high-end cloth, these colours are not for me. They would make super coats or jackets, or a nice little skirt for someone with a warm complexion who looks good in lighter shades. But I am not that person. This often happens. I like something and can appreciate it’s beauty, but I know it won’t like me back. I sometimes wish I had a red-haired alter-ego, close friend or loving sister who I could design, make or buy for. For example, where searching for a patterned jumper for my SWAP I was drawn to a nice sweater (if you have light, warm colouring). An appreciation of what colours suit me stops me buying items like this although I think this is a very pretty jumper (but not with those trousers). Did you spotted the matches already? The Brora cardigan, and the charcoal/magenta and the bubbly pink wool. I like these together and I have more or less decided that a charcoal and cerise colour palette may be just what I need. The charcoal/magenta is an exceptional, sensational fabric, ex-Roland Mouret and I am excited by it. But I think it needs turquoise, or light green, or blue to stop it being too strong and deep for me. This is what I felt about the boucle. It is pretty dark, although blue rather than black, and a creamy white rather than black and beige as it appears. If I were to use it, it would be best for a lower-half garment. 2.5m of the charcoal and magenta suiting. I think it will be either the centrepiece coat or a one of the suits. 1.5m of the navy boucle, although this may not appear in the SWAP. 1m of the dinosaur fabric, of course. It’s navy, it is pure cotton and it will need mounting on a second fabric, obviously, ( it’s full of holes). It was an impulse buy and nothing to do with the SWAP. I just thought it was so unusual I had to have it. And of course Ted loves dinosaurs and knows all their names. I have made a provisional decision on the suits; two simple, classic suits which differ from each other. One has a mandarin collar, the other has revers. One is somewhat rectangular, the other is closely fitted and shaped. Neither is over designed and both will flatter nice fabric, allowing a mix and match approach. The first has an A line skirt, the second a pencil skirt (or pleated option). Simplicity 7305 is a 1967 suit with a stand-up collar. 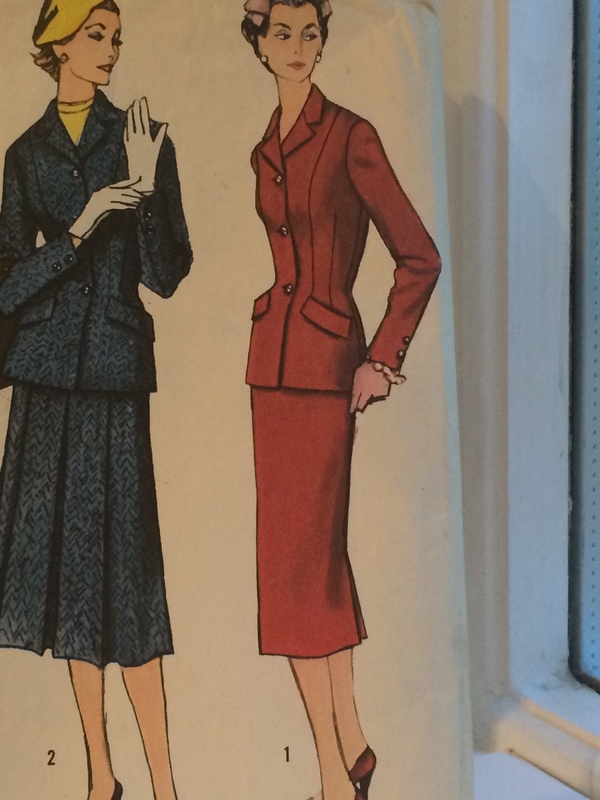 The second 1950s suit is S.100. I will make a few modifications to these patterns as we go along, but the contrast of styles pleasing and the patterns are unpretentious. The S100 is more challenging to both fit and sew, and I am more likely to use a plain fabric for this one, reserving the checked fabric for the S 7305 (or my coat). I have completed a toile for the reversible skirt. Now I need to download, toile and fit the trousers, and if I have time also toile one or both of the suit jackets. It’s a tall order before Christmas, so we will see. Good luck with all the ‘to-do’s! Did you have one of those cute shopping trolleys to wheel your new stash home?! Though I’m in South London, Brixton is too far without quick connections so I don’t go there but I have been meaning to go on a hunt for wax cloth. I’ll pop into Simply Fabrics: thanks for the tip! Funnily enough, Sew2Pro, I did think of buying a shopping trolley – one with brightly coloured veg on it. Instead I carted two heavy carrier bags (as well as my jam-packed ruck sack) to work, then Esme’s, then home. All by bus or tube. Feeling more like a donkey than a designer, at the moment. And Simply Fabrics is worth it. Go once, even if you decide never to go again. It is just a great place. I loved reading about your process and the fabrics you chose are excellent. The cerise and charcoal combination is very exciting! The suits are also perfect, as always – different but providing lots opportunity for mixing and matching. They are both going to look terrific on you. Such great choices and so inspiring!! PS I have to admit that I always wished I had been born a redhead. I love that colouring. I chuckled at the inclusion of “young designer in brown velour” and “nuns in Africa” in the same paragraph! A great read, as always. Great plans there – loving the fabric. And no – I didn’t see those dinosaurs until you pointed them out. How cool. You are so lucky to have real fabric stores within reach!!!! Stores with stories and fascinating clientele and great prices…Holy Smoke! 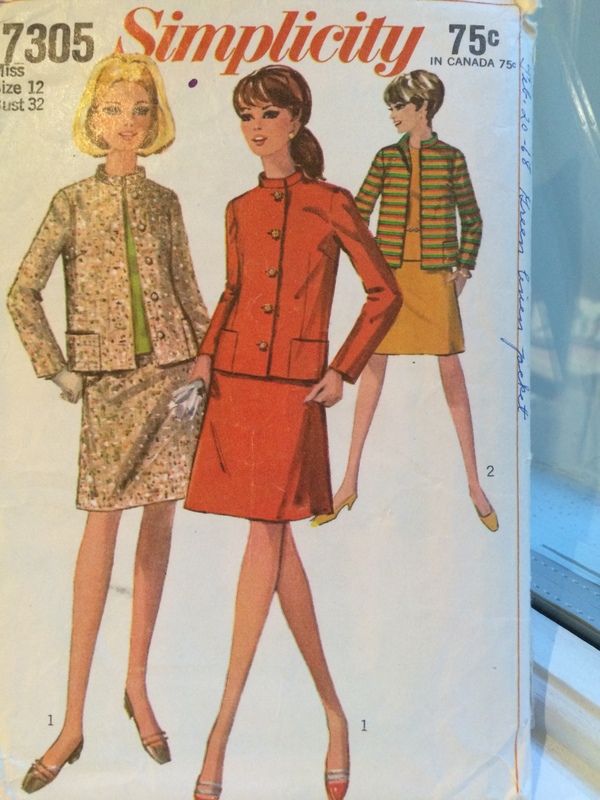 Cool that you have patterns from way back that can be called upon to work with new fabrics…really looking forward to see what magic happens next and some fabulous fashions! Reading your blog is a real treat! You SWAP is getting more exciting with each post. Its such fun to follow along ……… lovely choices. The one store (Fabricland) has moved from my end of town……..so now I have to go cross town and its so annoying when I enjoyed the other location, close to home. Today …….I crossed town…….and I looked and I looked and I looked…… and could find Nothing that I wanted! Wahhhhhhh, (sad face, pouty…….poor me.) I came home with double seam binding and a case of top stitch needles, that’s all. But, Im happy though because I didn’t buy something that was, the wrong colour, the wrong weight, and a pattern I didn’t care for. Surely they will be getting some new stock in shortly! I have never bought on line……., and frankly I’m afraid to, though I see plenty of people do. In the mean time…….. good luck with all your projects Kate! looking forward to seeing your next step completed. I think maybe I should go and sort my fabric collection into smaller, coordinated groups. Right now I have all the wools together, all of the knits together, etc.